Although managers are expected to solve problems promptly and wisely, most managers have never been taught problem solving skills. This module is designed to build the problem solving skills that will help your managers identify and systematically eliminate barriers that stand between them and their objectives. Managers will learn to identify problems, set objectives, develop alternate plans of action, and evaluate and select the best plan of action. Every day your managers make a nearly automated set of decisions. However, for more important decisions, managers need critical decision-making skills to specify the desired outcomes, determine criteria, select and evaluate alternatives, assess risk, and develop an implementation plan. In this module, your managers will learn how to define the situation, state the objectives, generate and evaluate options, perform risk analysis, and implement and monitor results. Thinking managers are effective managers, yet very few courses deal with thinking clearly and analytically. 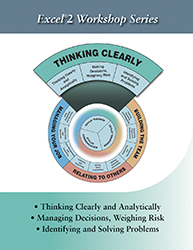 In this module, your managers will learn to recognize personal bias in their thinking, use inductive and deductive thought processes, identify and correct faulty thinking and logic, analyze how others think, generate lists of advantages and disadvantages before taking a stand-in short, they will learn a process for thinking analytically.